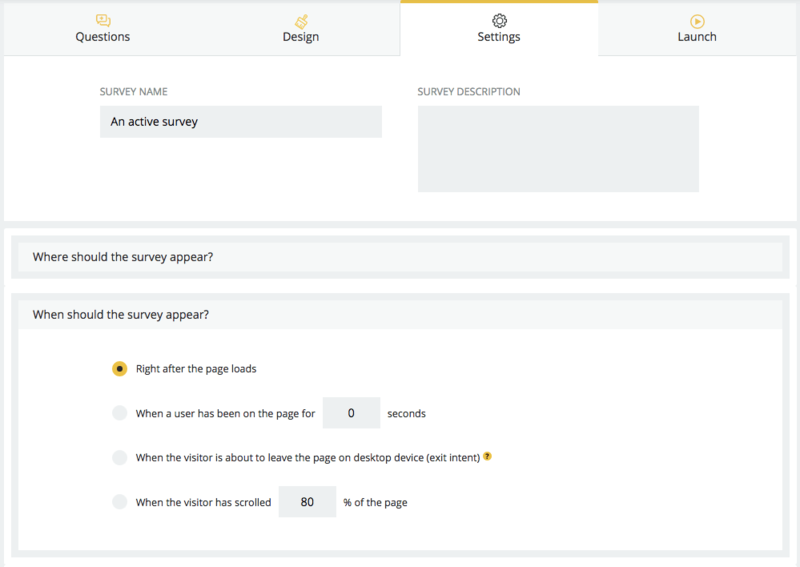 To set when should the website survey appear on your website, go to the Settings of your survey and open When should the survey appear? section. This option is the best for grasping the first impression or asking for a source visitor has accessed your website from. The best option in most cases- makes the surveys less obtrusive by letting the visitor adapt to a page and then displaying a survey. Most of our users choose around 5 second period, but some display a survey after 20-30 seconds. This option allows you to display a survey when a visitor is about to leave the page, moving the cursor towards the address bar or to close the tab. It's the best moment to ask your clients why didn't they settle a payment or left a cart. It's the best way to check if your website was clear and provided sufficient information, or if they are interested in having a call about the feature they just have read about.